1. The scariest guns kill the least amount of people. “Following implementation of the ban, the share of gun crimes involving AWs declined by 17% to 72% across the localities examined for this study. The decline in the use of AWs has been due primarily to a reduction in the use of assault pistols (APs), which are used in crime more commonly than assault rifles (ARs). There has not been a clear decline in the use of ARs, though assessments are complicated by the rarity of crimes with these weapons and by substitution of post-ban rifles that are very similar to the banned AR models. The decline in AW [assault weapon] use was offset throughout at least the late 1990s by steady or rising use of other guns equipped with LCMs [large capacity magazines] in jurisdictions studied. …we cannot clearly credit the ban with any of the nation’s recent drop in gun violence. However, the ban’s exemption of millions of pre-ban AWs and LCMs ensured that the effects of the law would occur only gradually. …there has been no discernible reduction in the lethality and injuriousness of gun violence, based on indicators like the percentage of gun crimes resulting in death or the share of gunfire incidents resulting in injury, as we might have expected had the ban reduced crimes with both AWs and LCMs. Basically, the ban reduced the use of “assault pistols” but their use was simply substituted for other non-banned firearms. There was no evidence of the ban reducing the use of “assault rifles”, like the AK-47 or AR-15, nor was there evidence that the ban had any effect negative effect on overall gun violence. The authors believed that the nature of the ban meant that its effects would only become apparent over time, but also noted that the ban effects were likely to be “too small for reliable measurement”, even if renewed. If the results are likely to be statistically insignificant if the ban was renewed, and there is no evidence that the ban, which was a decade long, had any effect on the overall rate of gun violence, than there’s no point in renewing it. Furthermore, there is actually evidence that the ban may have had a positive effect on gun violence rather than a negative one. Consider research from economist Mark Guis, who found that “[gun-related] murder rates were 19.3% higher when the Federal ban was in effect“, after controlling for other relevant variables. This doesn’t necessarily prove that the ban caused a higher murder rate, but this finding seems to further refute any belief that the ban had a meaningful negative effect on gun violence. Additionally, despite the media craze about the danger of “assault weapons” like the AR-15, FBI data shows that ALL rifles were only confirmed to have been used in 322 homicides in 2012. 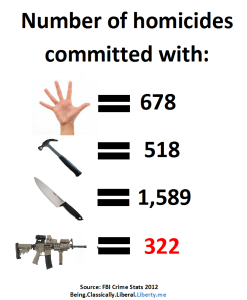 This is in comparison to 1,589 homicides committed with knives, 518 committed with blunt objects, and 668 committed with hands or feet. It’s also worth noting that both the number of homicides committed with long guns (rifles and shotguns) has fallen tremendously since the 1990’s. 2. Banning high capacity magazines doesn’t work. “[A]vailable studies on shots fired show that assailants fire less than four shots on average, a number well within [a] 10-round magazine limit”. Thus, the ban on high capacity magazines didn’t stop nor cause a decline in their use in crime, and even if it did, most crimes don’t involve more than 4 shots being fired and thus wouldn’t have been affected by the ban anyway. Gun control advocates cite often cite the statistic that there are 30,000 gun deaths per year. 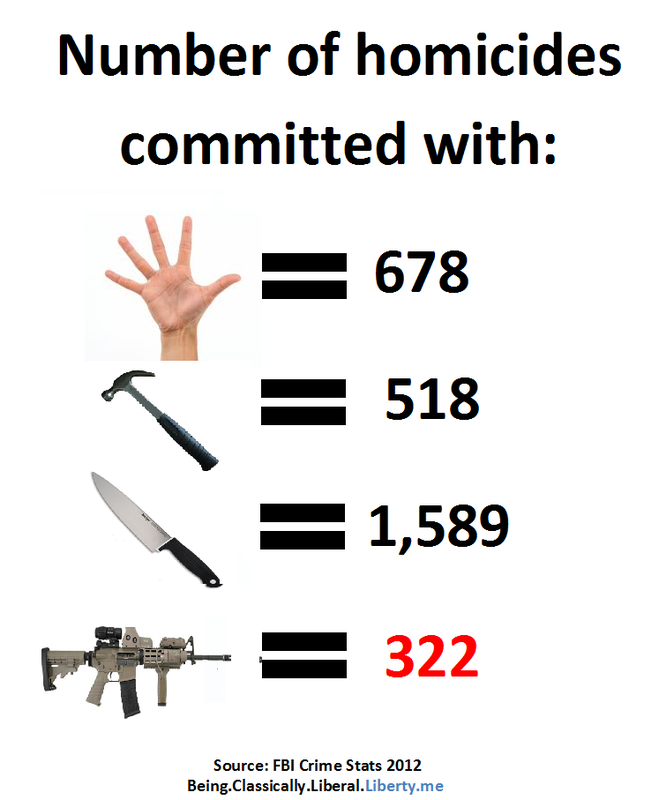 While this is true, it is misleading because the majority of those gun deaths are completely voluntary. In 2010, the latest year for which data is available, the CDC documents 19,392 suicides by firearm. Additionally, the FBI reports that there were 8,874 homicides committed with firearms that same year. That means that 69% of intentional firearm deaths in 2010 were suicides. Even confronted with this fact, gun control advocates may argue that restricting gun ownership is a good thing since it could reduce the number of suicides. While it is true that gun ownership is positively correlated with overall suicide rates in individual states in the US, a Harvard study found that there is no correlation between international suicide rates and firearm ownership. For example, Japan has a suicide rate double that of the US despite having near zero gun ownership. Many things correlate with suicide, that doesn’t mean that they cause it. Take for example a study which found that the amount of country music radio stations play is strongly related to the suicide rate, even when controlling for other variables like gun availability and poverty. Should we believe that country music causes people to off themselves? Maybe, or maybe there is another unrecognized variable (or reverse causality) driving the relationship. Regardless, if one believes the government should restrict gun ownership to protect people from their own choices, than stopping people from listening to country music, as well as forcing people to have healthy diets would also seem like legitimate government interventions into a person’s life. Such draconian and authoritative interventions could not possibly be supported by any believer in human free will. – 0.5% of unintentional deaths among all US citizens were firearm related. This is despite the fact that 37% of Americans live in a household with a firearm, according to Pew Research. -1.8% of unintentional deaths among children (age 14 and below) were firearm related. -The rate of unintentional firearm deaths is lower among children than the general population (0.12 vs. 0.19 per 100,000). -0.06% of unintentional non-fatal injuries were firearm related. -Unintentional fatalities due to bike accidents occur more often than unintentional fatalities due to firearms for the general population. For child fatal accidents involving firearms is about equal to the number of fatal accidents with bikes. – In 2013, whether they be intentional or not, gunshot wounds constituted 0.2% of all non-fatal injuries. -In 2013, gunshots wounds constituted a mere 3% of all violence related non-fatal injuries (this includes self-harm). When looking at non-fatal injury due to assault, only 3.8% of such injuries are caused by firearms. LOL! Your comments on magazine capacity made me remember this little incident with the gun control crowd. One of the best fallacies is when the gun control crowd says “Only police should have guns” because somehow, being an agent of the state bestows them with the gift of omnipotence when it comes to use and handling of a gun. THAT FOOL is a cop?? Yeah. If you think people can be stupid, and government and its agencies are made up of people, WHY would you want them to have power over you? Great article! There are so many myths behind the gun debate and you do a great job of dismantling so many of them. I am keeping this article for any future discussions about gun control. I also find it interesting that despite decreases in gun violence, people think that there have actually been an increase. Very good break down of the main issues within today’s debate! Very good choice of links, charts, and graphics to add some serious icing on the cake! By that standard, the US would appear to be less than two-thirds as violent as it really is. Yep, lefties have some streaks of honesty.